90 days have passed. The first year of The Wicked + The Divine is very much over. 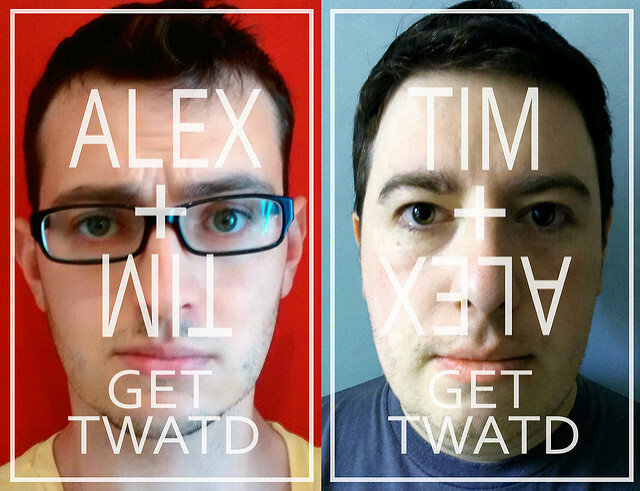 But Tim + Alex Get TWATD is still going strong, and both authors still have their heads attached. This volume: Fate & Death. Circles & Cycles. Questions & Answers (or …& More Questions, to be honest). Issue #11 changes, or at least challenges, so many of our fundamental assumptions about The Wicked + The Divine that it’s hard to know where to start. But let’s start with Ananke, who has been fundamentally reframed from the series’ Basil Exposition to its Big Bad. Killing the current protagonist just after she achieves what she’s been chasing the whole time, and then murdering her parents for good measure, is not the sort of thing you can justify or seek redemption for, certainly not in the eyes of the readership. So if Ananke is the villain of the piece, what exactly do we know about her? The truth is, very little. We know she’s been alive for a long time (at least as far back as the 1920s) and doesn’t appear to age beyond her already elderly appearance. We know she’s powerful enough to kill other gods and turn their abilities aside with little effort. And we know she can cause the gods to manifest, in numbers beyond the established twelve. Beyond that, the origin that she details in issue #9 could well be a carefully constructed lie, as could much of the other information that she gives. We can fairly safely assume she arranged the attack on Luci in issue #1 and killed the judge, starting the sequence of events that led to her ‘justified’ execution of Luci. But the question of why has barely been touched upon. Perhaps the answer lies in Ananke’s role as an agent of fate. The Wicked + The Divine is a book about death, its awfulness and its inevitability. The gods are fated to die within two years. The rest of us are fated to die, full stop. Ananke tells Baphomet that a death god is capable of extending their life by killing others – and what greater representation of death is there than the idea of fate, the inexorable advance of time and the tightly woven network of nature, nurture and predestination? Another interpretation comes from Ananke’s mention that Graves’ The White Goddess is based upon her. In Graves’ essay, the eponymous goddess is the font of all poetry, religion and culture, until she is supplanted by the male Judeo-Christian god. If the gods of the Pantheon are artists, inspiring humans to new ideas, new inventions and new ways of thinking, perhaps Ananke is culture itself, monolithic and eternal, consuming art and artists to fuel herself. I’m sure there are answers coming at some point in the future, but for now it’s clear that the Ananke we have known so far, and the answers she has given us, are no more substantial than the lace masks she wears, covering up her true self and keeping her intentions cloaked in shadow. Saying that circles are a visual motif in The Wicked + The Divine is a bit like pointing out that there are a lot of skulls in the comic, or that the creative team seem to have some affinity for exploding heads. If you’ve got eyes, you’ve probably noticed it already. But seriously, there are a fuckload of circles in The Wicked + The Divine. Let’s do a quick recap, in rough chronological order: the twelve-god cycle of the title page, itself made up of smaller circles; the table the 1920s gods sit around; the eclipses in Amaterasu’s eyes; eyes, in general; the occasional break-out panel; the holes Luci burns in her cell; the halo effect when the aforementioned heads explode; Dionysus’ smiley face badge; speech bubbles, if you want to be like that; the layout of the Valhalla throne room; the magic circle of people in Ananke’s flashback; the speaker-stack monoliths at Ragnarock ’14; the stage and skylight at the church where Inanna performs; Baphomet’s cross-inverting Sith Lord hand gesture; the rings in Persephone’s ears and nose. The ‘every ninety years’ conceit. “Once again we return”. The whole bloody plot so far, if you’ve been paying any attention. To be incredibly simplistic about it, ‘Laura meets a god who becomes her guide to the world of the other gods, who she meets one by one, including a god only just manifested, before finally her guide dies at the hands of another god’ could describe either of the first two volumes of The Wicked + The Divine. As the comic goes on imagery, dialogue and plot-beats get recycled wholesale, to the extent that almost nothing we see in the last issue is entirely new. The appearance of Ananke in Laura’s back garden might be unexpected, but it echoes Luci’s origin in issue #2. This is actually the third time we revisit the visual, thanks to a scene in Laura’s garden at the start of the previous issue. Once again, Baphomet lurks over a performance, realises he can’t do what he was planning to, and summons the devil onto his shoulder. The dialogue with his anti-conscience is almost exactly identical to the previous issue (“Him or you/You or them?” “No choice at all.”) adding to the sense that it’s a rote catechism, that killing doesn’t come easy to Baph. Laura’s tumbling transformation into Persephone is another visual we’ve seen twice before (issues #2 and #9, number-fact fans!). Ananke repeats the familiar words – “You will be loved. You will be hated.” – and, with the same hug for the newly-reborn god, “I’ve missed you.” It’s a well-practised ritual, for both Ananke and the comic itself, and Gillen almost seems to be baiting the reader to dismiss it as needless repetition. But suddenly (and it’s worth noting that, as Ananke’s grasping hand makes it way into the frame, forming into that Chekhov’s finger-gun, the dread in the collective pit of our stomachs again relies on repetition – we’ve seen the gesture twice before, and understand what it means) the scene proves itself very different to its predecessors. That rough plot structure I mentioned, with the pay-off of Laura’s guide dying? This time round, it was just a distraction. The echoes multiply, one voice becoming two, and the repetitions suddenly get tighter and quicker, like reverb. The same white-on-black text that marked Luci’s death – “I guess I’m grateful”. The parents look out from the house into the garden, like last issue, like Luci in her origin, and see something supernatural. Ananke dispassionately apologising, again again again. An exploding building, just like the one that opened the series, and the one that echoed it earlier this issue. “It was never going to be okay,” a phrase whose echoes have argued with themselves throughout the past eleven issues. This is a comic very deliberately eating itself, head becoming tail becoming head until there’s nothing left but the circle. Not so much a mic drop as a guitar left propped against an amp, feedbacking long after the band have exited the stage. There will be no encore. …Except there will be, which raises the question: what’s next? With the series’ main three characters all dead as disco, it’s kind of hard to say. But it seems sensible that The Wicked + The Divine will become a comic about breaking free from those cycles. Its plot structure will almost certainly have to, so maybe the question becomes: can the gods break free too? So who killed that poor judge in issue #1? Tim: Ananke makes the most sense, but part of me thinks we’ll never get a solid answer. Alex: The Y: The Last Man approach? It certainly seems like that part of the story is over now. Tim: It depends a lot on who takes up the mantle of protagonist now. If it’s Cassandra, I can see her keeping on at it. If it’s Baphomet, I doubt he’ll care. Who the hell is our main character now? Tim:In all honesty, I’d like it to become even more of an ensemble story than it has already been. I want more insight into everyone. What’s going on with this ‘thirteenth god’ business? Is it a one-off, or are there always more than twelve gods? Tim: Well, if we work on the theory that Ananke is doing this to prolong her life – as the god of fate, she is arguably also a death god, and thus capable of using the loophole she told Baphomet about to extend her own life – there would have to be way more than twelve gods. But that’s all conjecture at this point. It would explain why some pantheons have different gods: those were the ones that Ananke lets gain the spotlight that time around. And if she’s been at this for a long time, it explains what happened to the “missing” pantheons. Alex:I think it’s interesting that at the end of the issue, the twelve-god cycle diagram remains the same as it’s been all series. Does it only represent the gods that the public know about – a sort of public face for the Pantheon – or something else entirely? It’s worth noting that, for as long as Persephone’s brief flame is lit, it disappears entirely. Can a diagram be an unreliable narrator? The Prometheus Gambit – is it actually real? Tim: Introducing the idea seems like an odd thing to do if it doesn’t turn out to work in some fashion. You don’t need to bring up the Prometheus Gambit to introduce the whole ‘death gods extending their life’, and I think that part is legit – or at least it seems to explain Ananke’s motivations. Alex: Or it could be a tool of manipulation for her. As you say, this mythology has developed over the centuries, and Ananke’s been there the whole time – possibly propogating the Myth? Tara already got her own cover, but we’ve still never met her – what the hell’s going there? Tim: It seems odd that Tara has remained off-stage – she’s not exactly underground like Dionysus was. The fact that we haven’t seen her is almost directly opposite to how she’s treated in the story: posters everywhere, people sick of hearing about her. Perhaps it’s been a function of having Laura as our window on the world? She never seem particularly interested in Minerva either, who we haven’t seen much of… But then we know she liked Sakhmet, who hasn’t been explored much yet either. Alex: I get the impression Tara isn’t in the UK – is she the one god doing the whole World Tour thing? It’d explain why she hasn’t been around, at least, and help to differentiate her from everyone else – because after all this build-up, I wonder how different she will actually prove to be. If we see a different mix of gods every Recurrence, how do they get picked? Tim: Well, if the gods function as inspiration to humans, something clearly dictated that this 90 year cycle was necessary. Maybe the same thing determines what gods are necessary to inspire that particular generation of humankind? Like, in order to bring about the Industrial Revolution, you needed Susanoo, Coyote and Thor, but for today you need Baal, Lucifer and The Morrigan. Alex: To be honest, I’m starting to become suspicious of the entire idea of ‘every 90 years, twelve gods, for two years’. It’s reminiscent the 27 Club, the Voice of a Generation, that 11-year sunspot cycle thing that Morrison’s into – and those maybe aren’t the healthiest myths to be telling ourselves. They’ve got something in common with the stuff David Blake was saying at the last Ragnarock. As the oldest non-parent member of the cast, I think he’s got something in common with Ananke, and he’s telling these limiting narratives: “vintage pantheons”, “cycles and precedents”. What if the whole idea of the Recurrence is just another one of those myths old people tell kids, like Authenticity and The ’60s Were the Peak of All Culture? Is everyone really going to be dead by the end of the two years? Tim: I think so. Even if nothing else of the central concept remains, that will. Whether they are genuinely destined to die within that period is another thing, but I don’t think anyone’s getting out alive. Alex: I’m starting to wonder if it’s all self-imposed. Look at the ’20s – it’s a group of kids being convinced they have to end themselves, because That Is How It Must Be, they don’t just spontaneously combust. As I said earlier, I reckon the rest of the story has to be about trying to escape the cycle. The plot has broken from its groove, can the characters do the same? Tim: Yeah, I think that’s the happy ending on the horizon now. But, given what we know about the series’ themes, whether the plot is actually headed there is another matter entirely. Next time on Tim + Alex Get TWATD: We’ll be back sometime next week, ignoring the actual text and talking about ourselves – just for a change. Based purely on what we know about Ananke (and I'm not usually one for D&D rules-style analysis, but hear me out): if she wants to kill Laura, she already has the ability to just blow up her house – she'd rather not for unnecessary murders, but Laura is necessary (and Anake took the trouble to appear when her parents were out). So why turn her into a God and then kill her? Maybe this makes a quieter death? But, why turn her into this God? The God whose whole deal is that she travels to and from the underworld? I think this is the answer to one of the questions at least – the next volume is one-shots of one sort or another, and if we don't see Laura before that, I'd imagine that we'd see her back as the protagonist in the volume after that. Interesting stuff Andrew! You're not the first person I've heard suggest Laura may be coming back, and the Persephone thing makes total sense, but I'd actually be a bit disappointed if she does return, given that the a lot of the series is about the finality of death. …Does that make me a horrible person?